I first read about these cookies about eighteen months ago, via Twitter. The claim was these were the best chocolate chip cookies ever. Something which, given how obsessed the internet is with chocolate chip cookies, seemed like a pretty big claim to make. Unfortunately, the recipe required a chocolate toffee bar such as Daim, Skor or Heath and, as these are quite hard to come by in Australia, I made a mental note that if I did get my hands on some toffee bars, I would make these cookies and see if the claims really stacked up. Fast forward about six months when I after a rare trip to Ikea I finally got my hands on some of Danish toffee and chocolate Daim bars. When I got home I googled the recipe but I couldn’t find it anywhere. There was nothing in my searches that fitted my memory of this cookie. The chocolate and toffee bar cookie all over the internet was a rich, brownie-like double chocolate and toffee cookie from Barbara Fairchild, and while they received outstanding reviews, it was nothing like my memory of the elusive best ever chocolate chip cookie. Finally, I gave up, I used the Daim bars in my regular chocolate chip cookie recipe and while the cookies were undoubtedly good, they weren’t spectacular enough to warrant the hyperbole of the ‘best ever’ claim. Two months ago I discovered a USA foods outlet had opened in near my sister’s house. This store is Americana food heaven – Graham crackers, Old Bay seasoning, an amazing range of hot sauces and barbecue spice mixes… and salt water taffy! (A delicacy I only discovered when my niece brought some back from a holiday in the States) Along with this bounty, I picked up half a dozen of the elusive Skor toffee bars. Back home, the Google gods smiled kindly on me, I managed to fall down the right rabbit hole and find the recipe I had searched for so fruitlessly months before. Best ever is a pretty big claim, but there are a few points of difference in these cookies that make them stand out from the crowd. 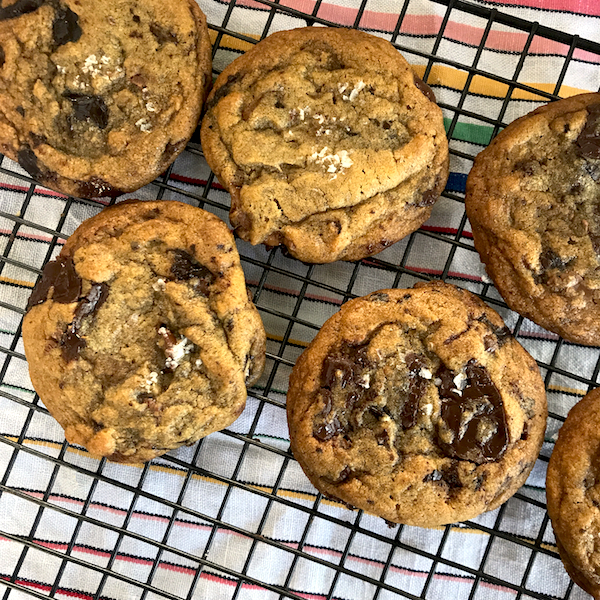 The browned butter gives them a nutty, caramel tinged depth of flavor, chopped chocolate instead of chips makes pools of dark chocolatey pockets of gooey-ness offset by the occasional pop and crunch of chunks of Skor bar. This is a serious, sophisticated cookie, it might not be the best ever but it would have to be up there in the Parthenon of chocolate chip cookie perfection. Brown butter by cooking in a medium saucepan over medium heat. Stir often, until it foams the browns (About 5-8 minutes) Once it browns, immediately scrape into a large bowl to cool. If you have never browned butter before here’s a step by step guide. Whisk together flour, bicarb soda and kosher salt in medium bowl. Add eggs and vanilla and beat until mixture thickens and lightens about (1 minute) Reduce speed to low, add flour mix and beat until just combined. Mix in toffee pieces and chopped chocolate with a wooden spoon. Allow dough to sit for at least 30 minutes, or preferably overnight. The dough can be refrigerated in an airtight container for up to three days before baking off. Allow dough to return to room temperature before baking cookies. When you are ready to bake. Place rack in centre of oven and preheat oven to 180C (160 fan forced) Line baking trays with baking paper. Form dough into ping pong size balls and place on a baking sheet about 8cm apart. Do not flatten the cookie, they will spread as they cook. Sprinkle cookie dough with sea salt. Bake in oven for about 9-11 minutes until edges are golden brown. Cool on baking sheet for ten minutes before transferring to wire rack to cool completely. Repeat with remaining dough. * The original recipe calls for chocolate pastilles or wafers but these were impossible to track down even in my local mecca of US foods, I used chopped 70 % cocoa dark chocolate. OH WOW! If these aren’t the best, they certainly LOOK like they are! I feel like I can smell them through the computer!